What Is the Statement of Purpose for PhD? Getting onto a graduate program is never going to be easy. You will have to compete against many others that are going to be as highly qualified as you are. Often your PhD statement of purpose can be the deciding factor in your selection which is why writing it needs to be done with such care. Writing a statement of purpose for MBA or a doctoral degree application can be very difficult which is why you may need our help. We can provide you with all of the advice and help that you may need along with a statement of purpose for PhD sample to help guide your writing. We will show you how to make a real impact with your writing so that you have the best chance of being selected for a place with your application and SoP for PhD. What is the purpose of the PhD SoP? While your GPA, your GRE score and past experience are all important the admissions committee will still want to get an idea of how you will fit into their program. This is where your statement of purpose comes in. You need to explain just how well you will work within their program and what you bring to it. Is the SoP an important part of the application? Yes; the admissions committee will often turn to this part of your application when there is little else to differentiate you from the other applicants. Well written it can even help you to win a place if other parts of your application are below par. How soon should I start writing statement of purpose for PhD application? A good PhD statement of purpose does not just happen. It takes a lot of hard work and commitment to craft something that is going to get you noticed. You should start at least 3 to 4 weeks before you need to submit it if not before. Every program has their own requirements for application so you will need to take a good look and follow their specific instructions. A typical statement of purpose is usually between around 500 to 700 words in length. Can I send the same SoP to each program I apply to? Your statement of purpose for PhD admission just like your SoP for MS in computer science should be tailored carefully to the program that you are applying to. This, however, can be a lengthy process if you are applying to a number of different programs. What most people do is to have a section of the statement that you customize to reflect their expectations while keeping the rest the same. That being said, the better you reflect the programs expectations the more chance you have of success. Who is going to read my SoP PhD? The admissions officers will usually be faculty members and will be looking to see just how well you will fit within their departments. What should I include within my statement? Why are you interested in your subject field? What your intended research areas are? What skills do you have that will help you in this program? Why do you want to work on this specific program? What are your career goals once you have gained your degree? Do I need to give a specific statement of what I wish to research? The committee will be looking for an applicant that has a clear idea of the topic areas that they are interested in researching. They will need to know after all if they will be able to provide you with the support that you will need. However, you do not need to be so precise with your research field and you will be able to alter it later if your interests have changed. Should I mention specific members of the faculty within my statement? Yes; it will help your application if you can mention specific members of their faculty who you have an interest in working with. There is also nothing wrong with contacting them directly to ask questions about their research and current and future projects. How well written must my statement be? As with most things in life, first impressions really do count. So ensure that your SoP for PhD application is carefully checked before you make your submission. How Should Your SoP for PhD Admission Be Structured? 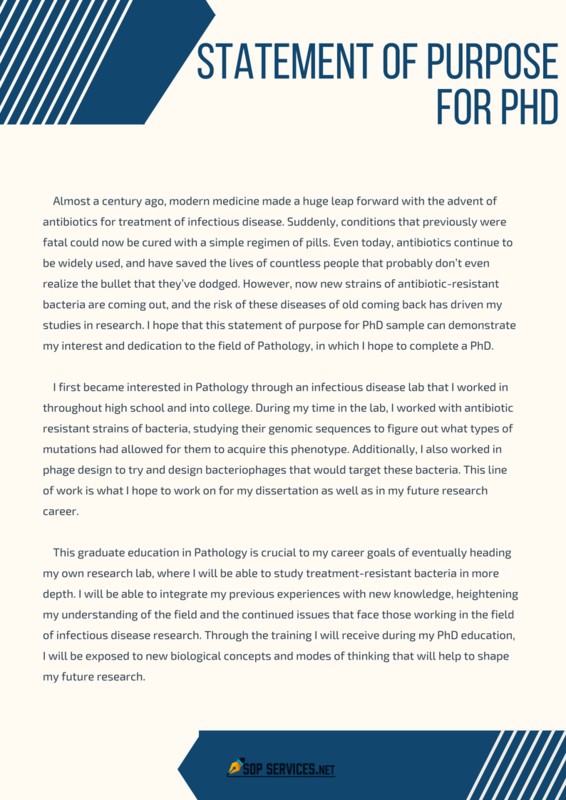 Introduction: let them know what areas you are interested in researching and why you have become interested in that field. Give your experience: provide them with a summary of your research experience. Including previous research conducted, papers that you have published, and any relevant work experience in this area. Discuss your current activities: show how what you are doing now is relevant to and is preparing you for the research that you want to undertake. Detail your interests: give the reader a good understanding of your current interests and what problems or areas you are looking to research. Ensure that you do your homework and tie this section to what the program actually offers in the way of support. Conclude by summarizing what you have written and showing how it can support your future career plans. Tailor your statement to the specific requirements of the program you are applying to. Show what you have achieved and the relevant skills that you have with clear examples. Do give a clear understanding of the areas in which you would consider doing research. Do show what your future career goals are. Do check your work carefully so that there are no errors within it. Make statements that you can substantiate. Don’t use vague or clichéd statements that are meaningless. Don’t use slang or acronyms that may not be understood. Don’t write about anything that is not relevant to your application. Don’t repeat information that is covered in other parts of your application. Always carefully review the expectations of the program to identify specifically what they are looking for. This should always be carefully reflected in what you write. Look at our PhD application statement of purpose sample for writing guidance. A good SoP for PhD sample will show you the style of writing that you should adopt as well as the areas that you need to cover. Outline your PhD statement of purpose before you start writing, this will help you to ensure you cover everything that is required. Work on your opening line: this must be able to hook in the reader and make them interested enough to want to read on to find out what you will say. Be concise and precise with what you have to say: ensure that every sentence and word adds real value to your application. Make sure to get the best help possible for writing an amazing SoP PhD today! Why Work with Our Experts for Your Statement of Purpose? Our SoP writers and editors are some of the best that you will find online. With us, you will always get the support that you need to make your application something that you can be proud of. From writing a clear career goal statement to letters of recommendation our specialists can help you with all aspects of an effective application. Direct contact with a SoP writer that is fully qualified with a PhD degree and many years of relevant experience. Free proofreading and plagiarism testing on every order so you can be sure your statement will be free from errors and unique to you. Fully confidential support at a price you will not better: we display our prices clearly and there are no hidden extras that you will be expected to pay. A quick turnaround: we can get your statement back to you as quickly as you need it and will never deliver late. Full satisfaction money back guarantee on all of the professional services that we provide for you. Submit a PhD statement of purpose as part of your application that you can be proud of with the support of our highly skilled yet affordable experts!